Tamás Karáth and Father Peter Volek are two Nanovic Faculty Scholars from universities that are part of the core of the Catholic Universities Partnership. Since 2003, the Nanovic Institute has been helping to rebuild Catholic higher education on the territory of the former Soviet Union. In 2009, the group expanded to include new friends at the Universita Cattolica del Sacro Cuore (Milan) and the Institut Catholique de Paris. In 2013, it welcomed additional friends from the Catholic University of Croatia (Zagreb) and the Pontifical University of St. Thomas (Rome). The activities of this group are ongoing and fruitful, based on the principle that a focused group can do small but important things well. 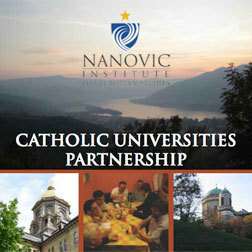 Please watch the video and contact the Nanovic Institute if you would like to learn more about the Catholic Universities Partnership. Originally published by Nanovic.nd.edu at international.nd.edu on November 08, 2013.